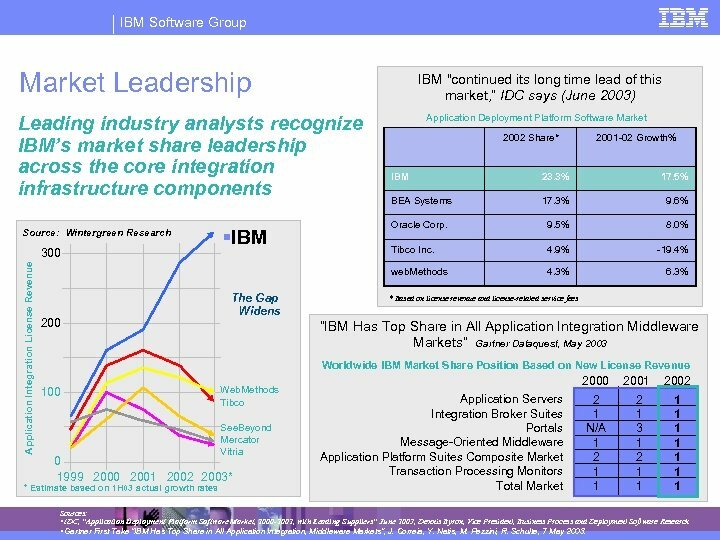 IBM Software Group Market Leadership IBM "continued its long time lead of this market, “ IDC says (June 2003) Leading industry analysts recognize IBM’s market share leadership across the core integration infrastructure components 2002 Share* 2001 -02 Growth% 300 200 §IBM The Gap Widens IBM 23. 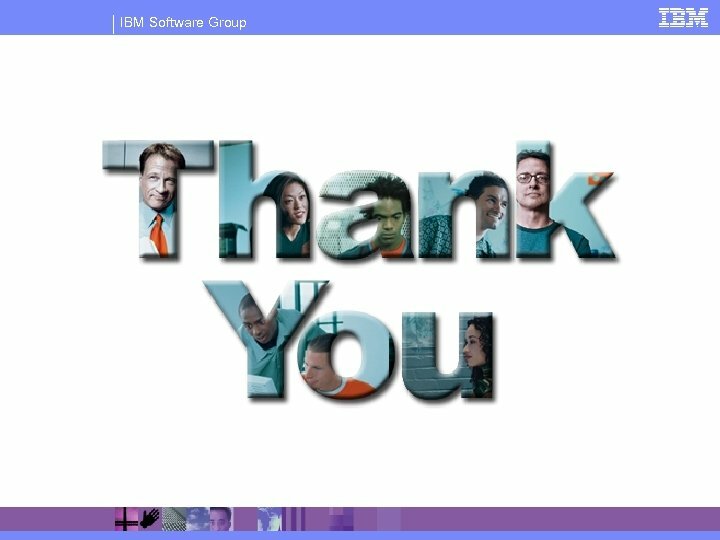 3% 17. 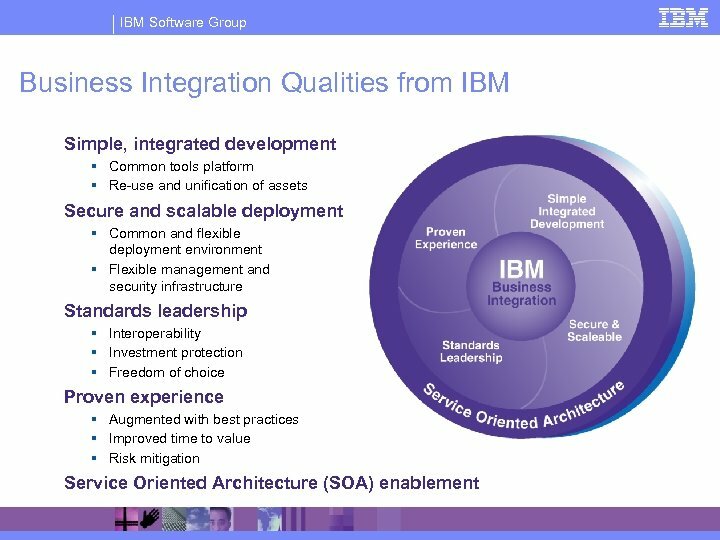 5% BEA Systems 17. 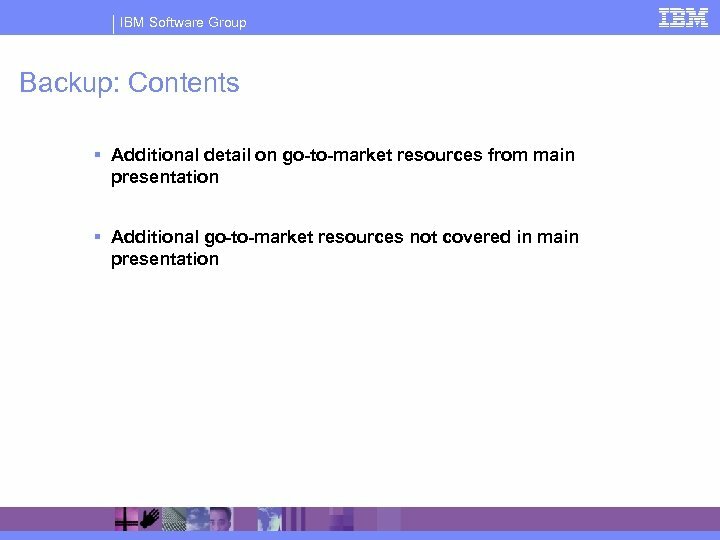 3% 9. 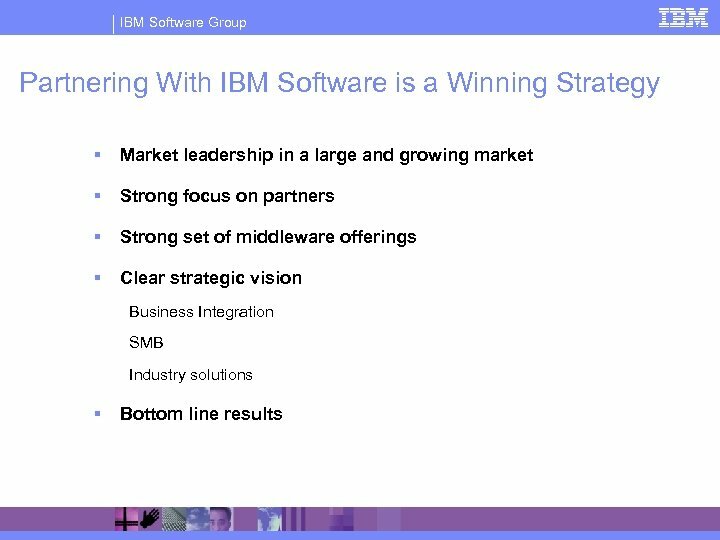 6% Oracle Corp. 9. 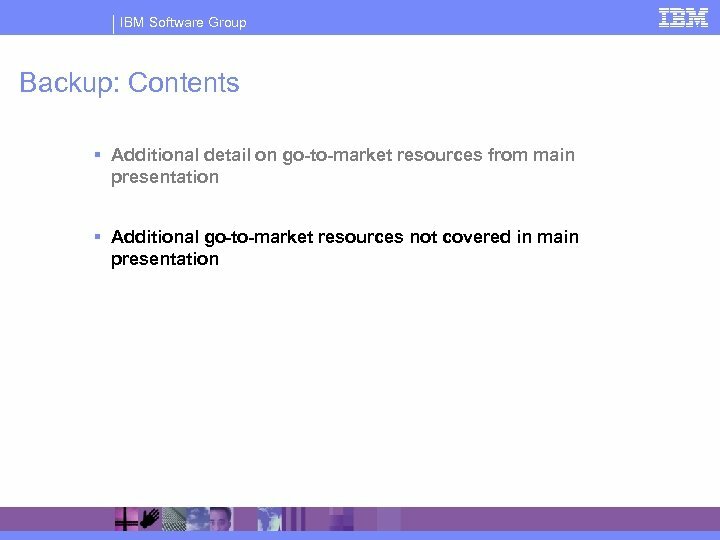 5% 8. 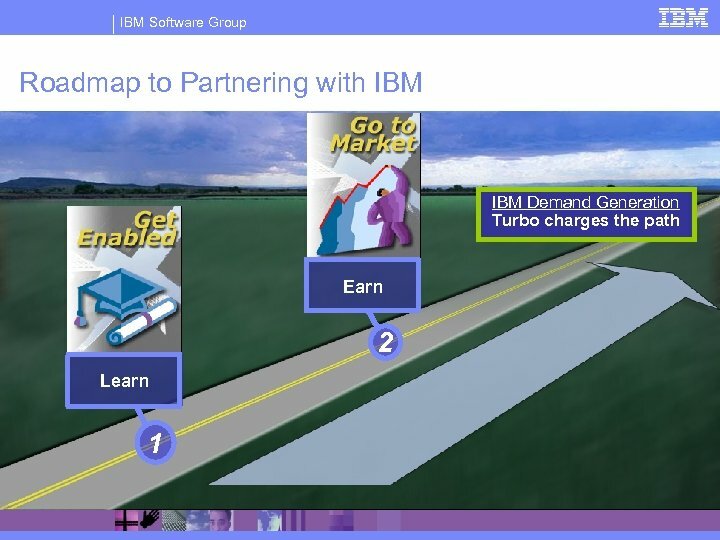 0% Tibco Inc. 4. 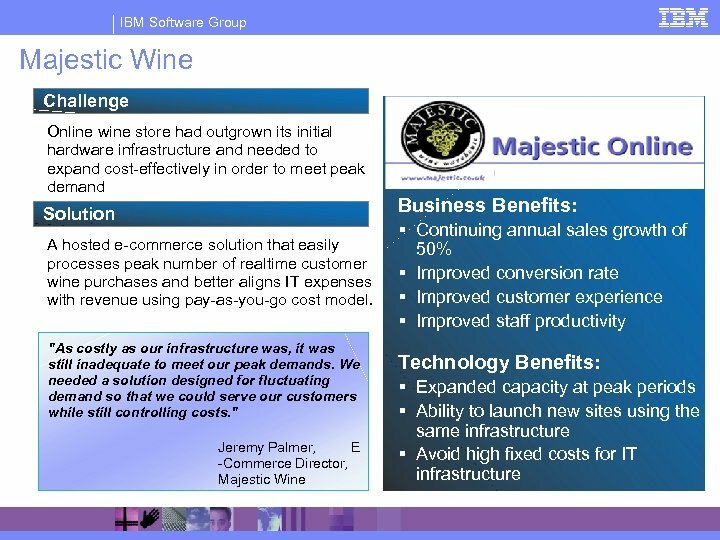 9% -19. 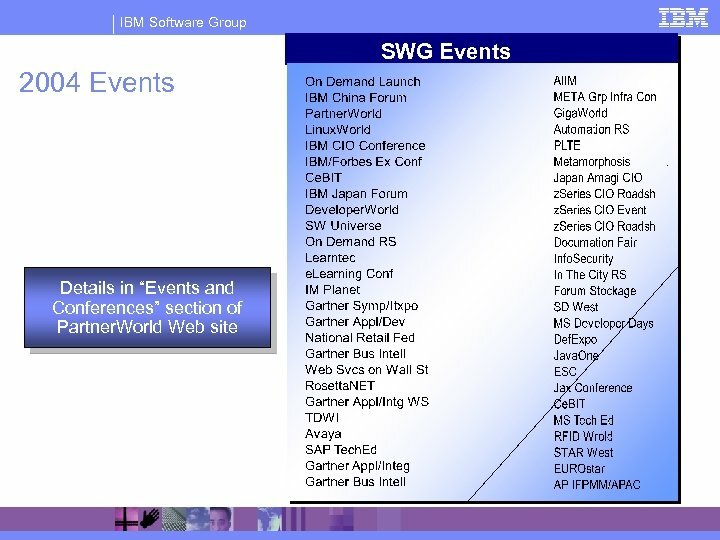 4% web. 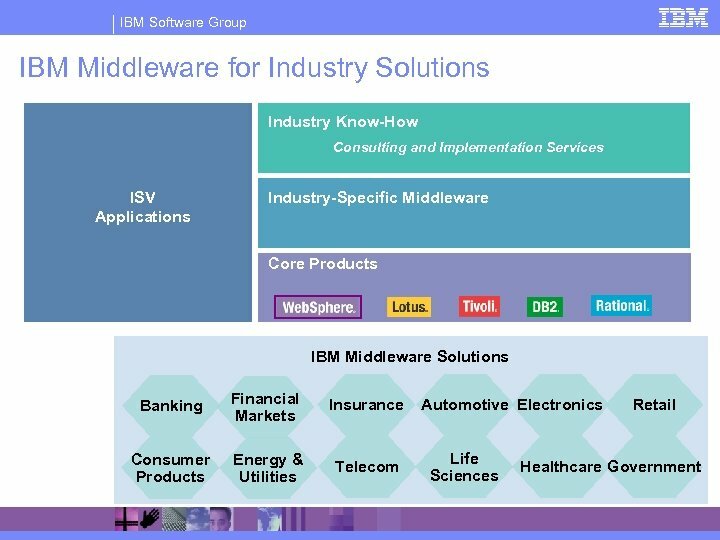 Methods Source: Wintergreen Research Application Integration License Revenue Application Deployment Platform Software Market 4. 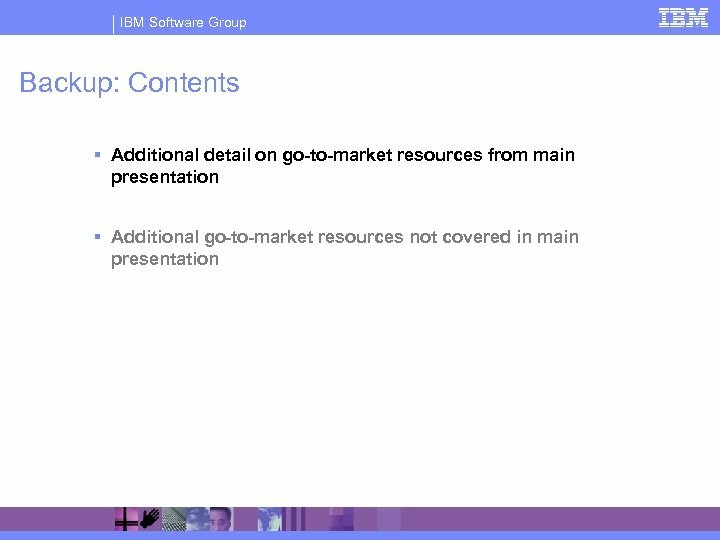 3% 6. 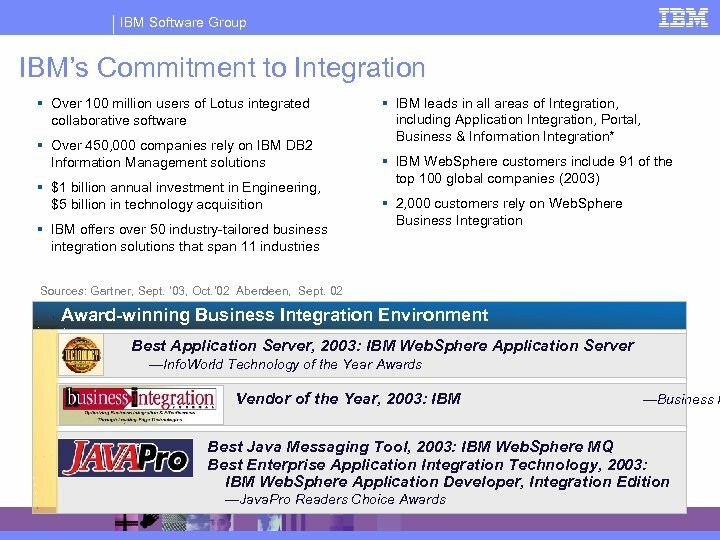 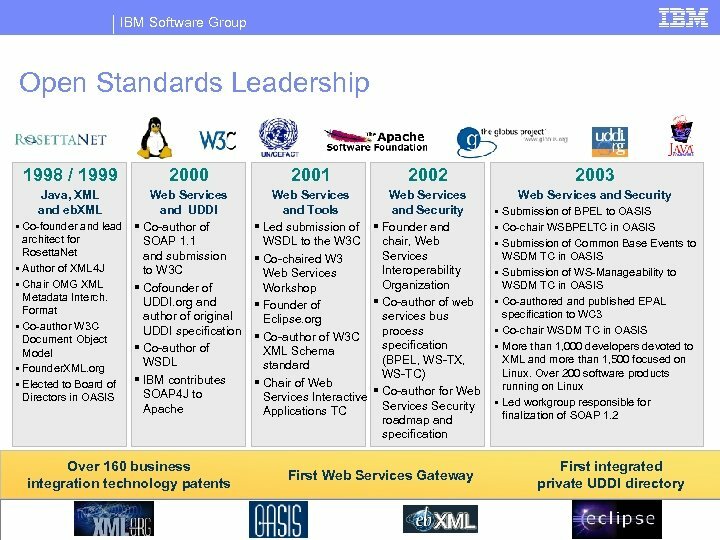 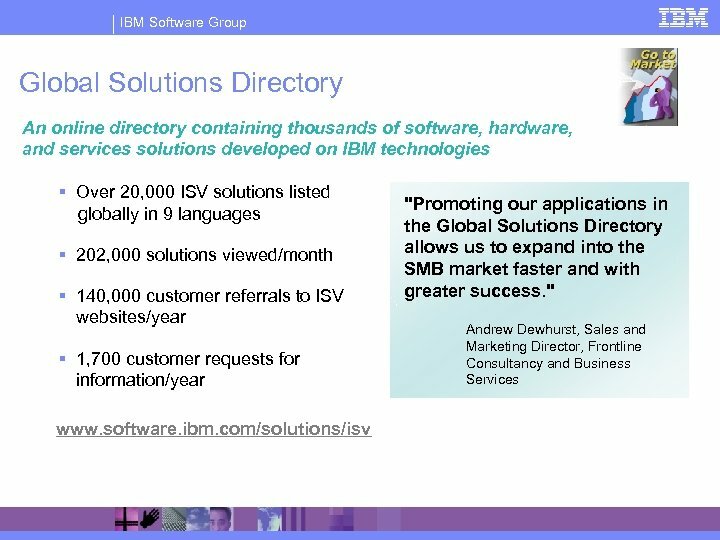 3% * Based on license revenue and license-related service fees “IBM Has Top Share in All Application Integration Middleware Markets” Gartner Dataquest, May 2003 Worldwide IBM Market Share Position Based on New License Revenue 100 Web. 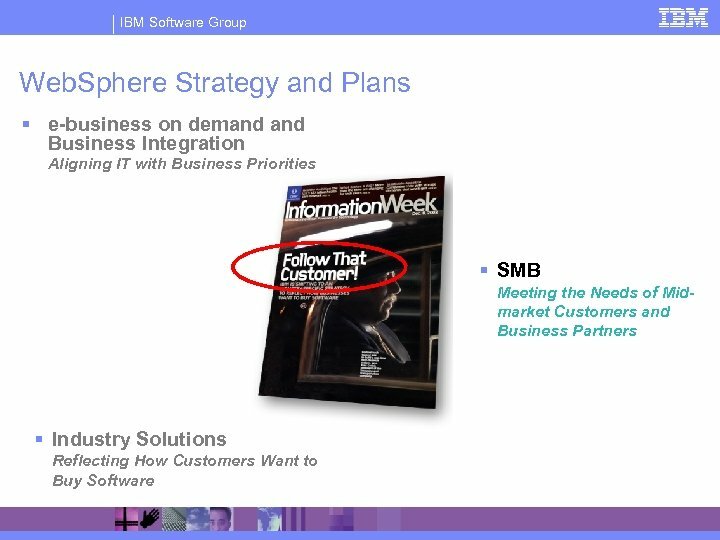 Methods Tibco See. 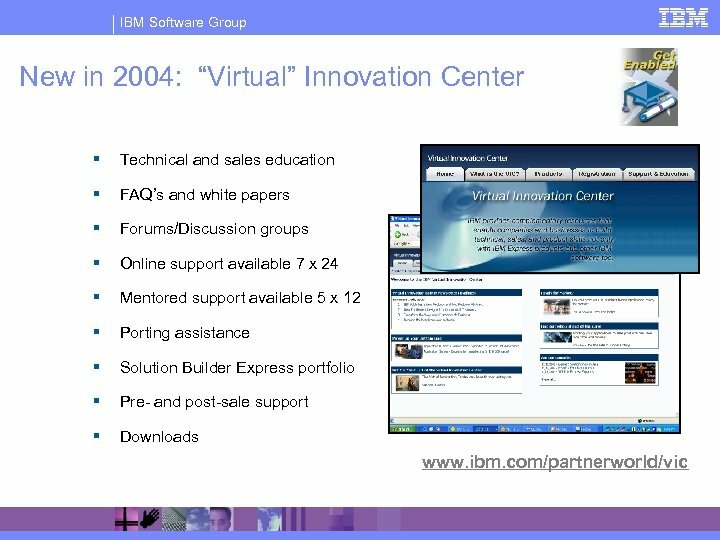 Beyond Mercator Vitria 0 1999 2000 2001 2002 2003* * Estimate based on 1 H 03 actual growth rates 2000 Application Servers Integration Broker Suites Portals Message-Oriented Middleware Application Platform Suites Composite Market Transaction Processing Monitors Total Market 2001 2002 2 1 N/A 1 2 1 3 1 2 1 1 1 1 1 Sources: • IDC, “Application Deployment Platform Software Market, 2000 -2002, with Leading Suppliers” June 2003, Dennis Byron, Vice President, Business Process and Deployment Software Research • Gartner First Take "IBM Has Top Share in All Application Integration, Middleware Markets", J. Correia, Y. Natis, M. Pezzini, R. Schulte, 7 May 2003. 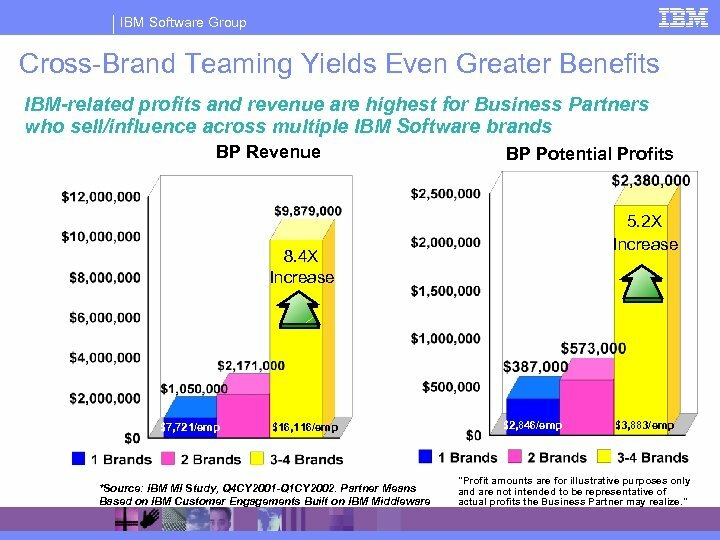 IBM Software Group Cross-Brand Teaming Yields Even Greater Benefits IBM-related profits and revenue are highest for Business Partners who sell/influence across multiple IBM Software brands BP Revenue BP Potential Profits 5. 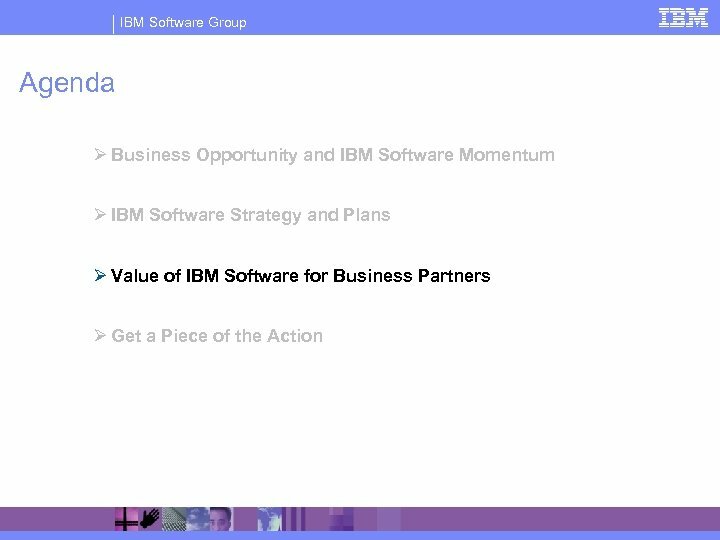 2 X Increase 8. 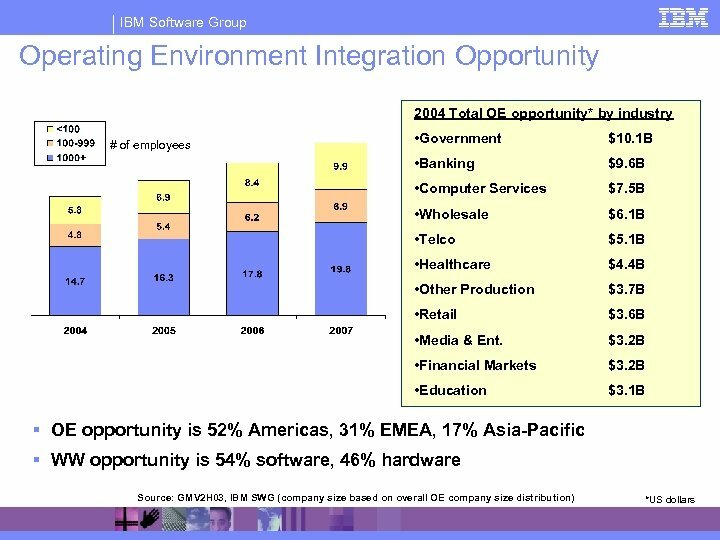 4 X Increase $7, 721/emp $16, 116/emp *Source: IBM MI Study, Q 4 CY 2001 -Q 1 CY 2002. 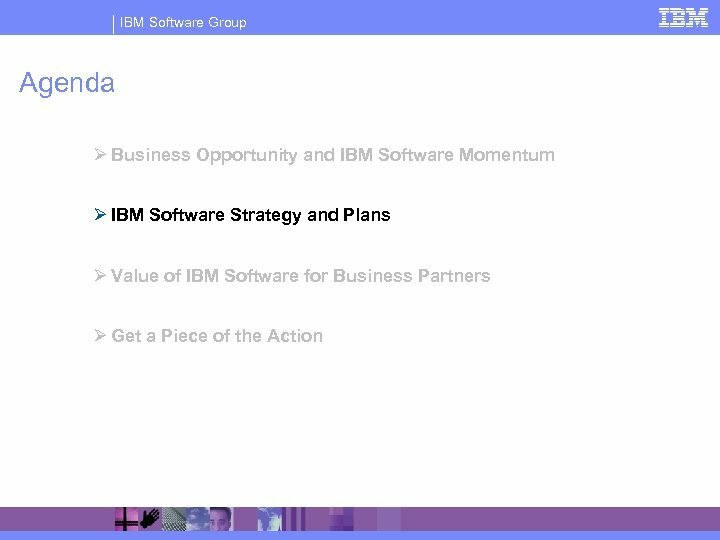 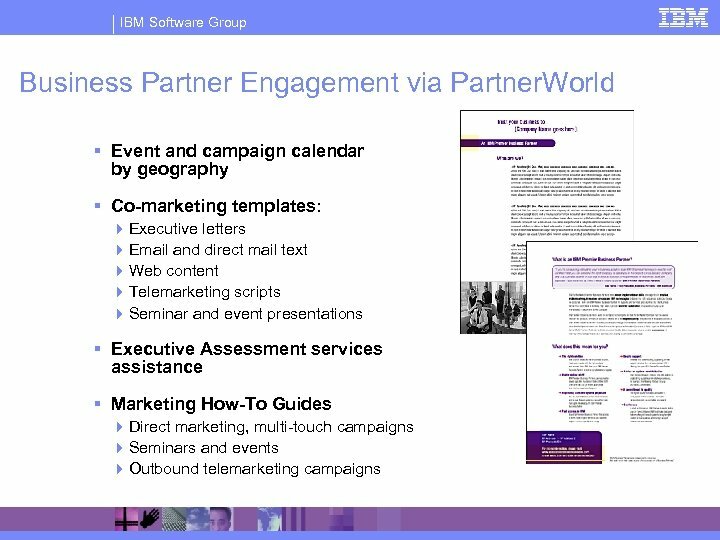 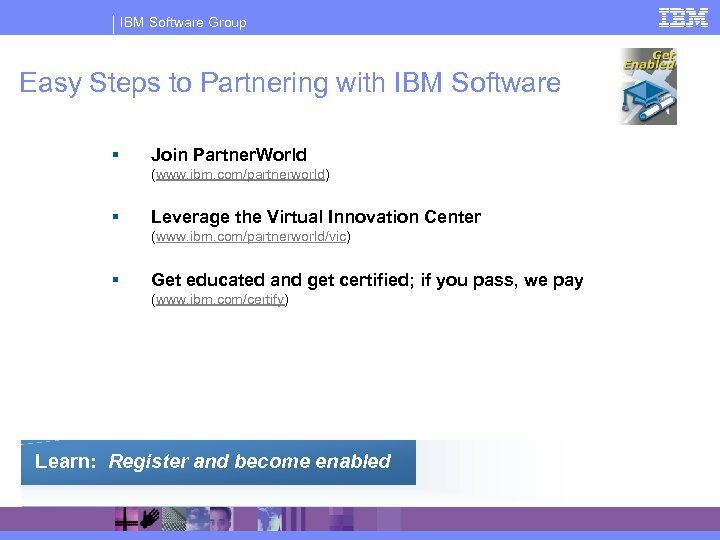 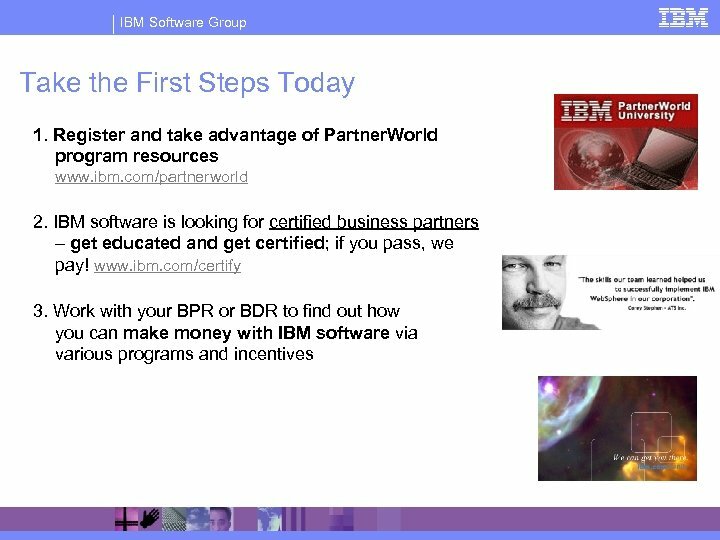 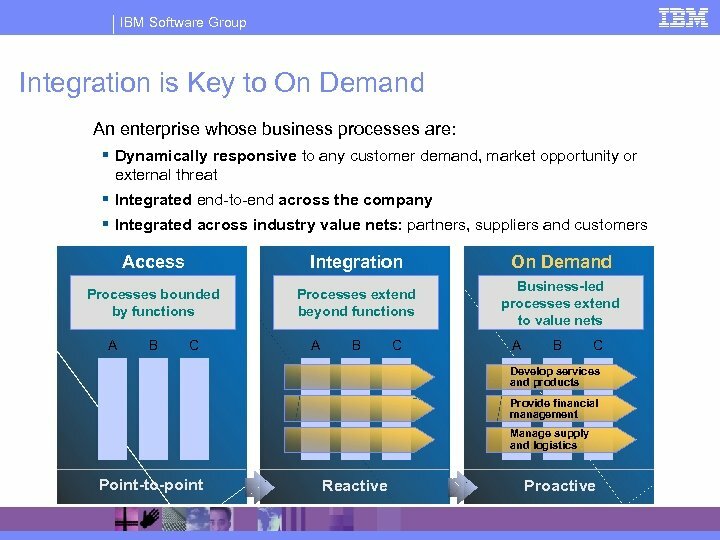 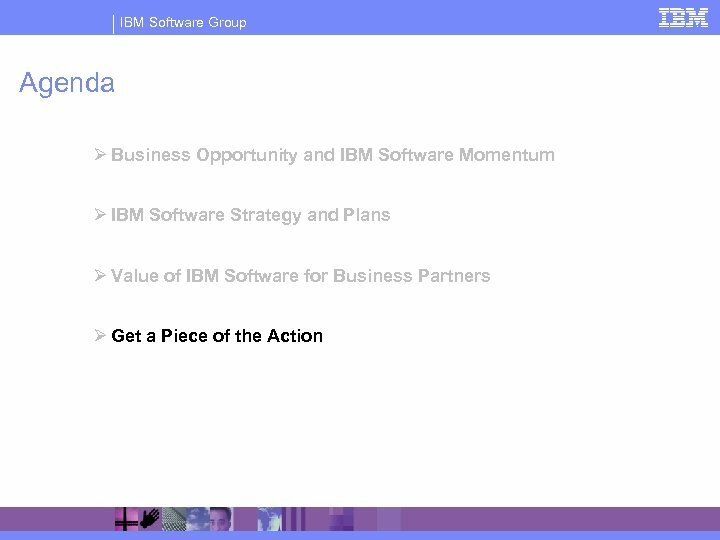 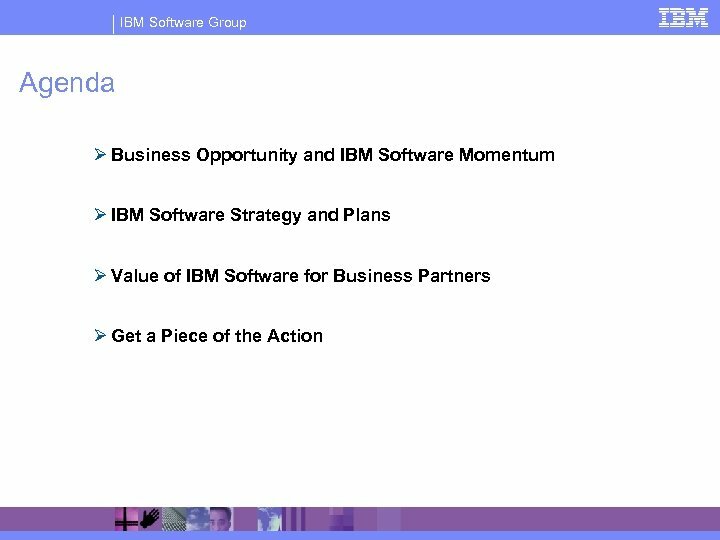 Partner Means Based on IBM Customer Engagements Built on IBM Middleware $2, 846/emp $3, 883/emp "Profit amounts are for illustrative purposes only and are not intended to be representative of actual profits the Business Partner may realize. " 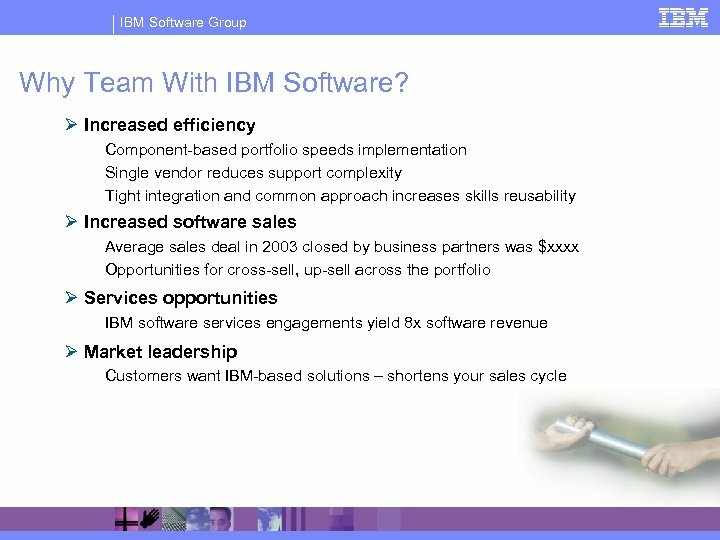 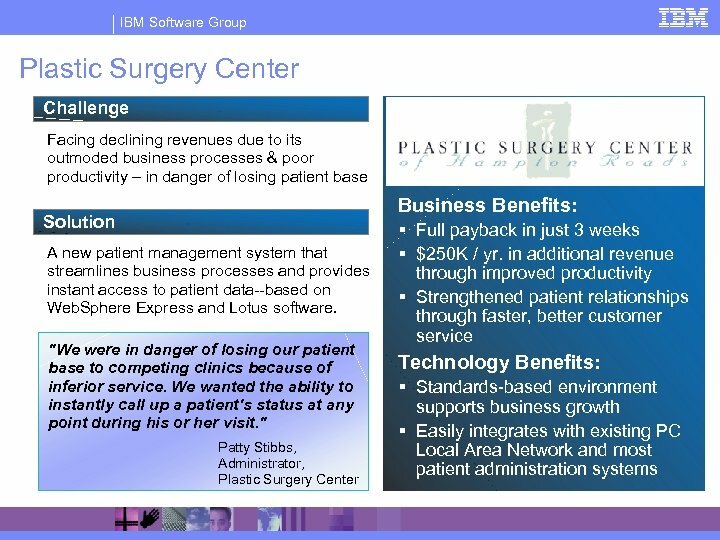 IBM Software Group IBM Solutions Builder Express Portfolio What is IBM Solutions Builder Express Portfolio? 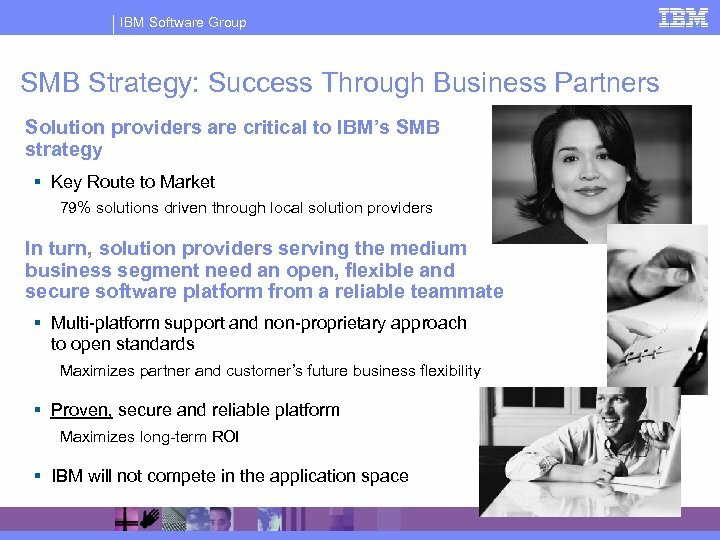 IBM Solutions Builder Express is a portfolio of Solution Starting Points which are reusable assets that help Partners sell, design and implement SMB relevant solutions based on IBM middleware. 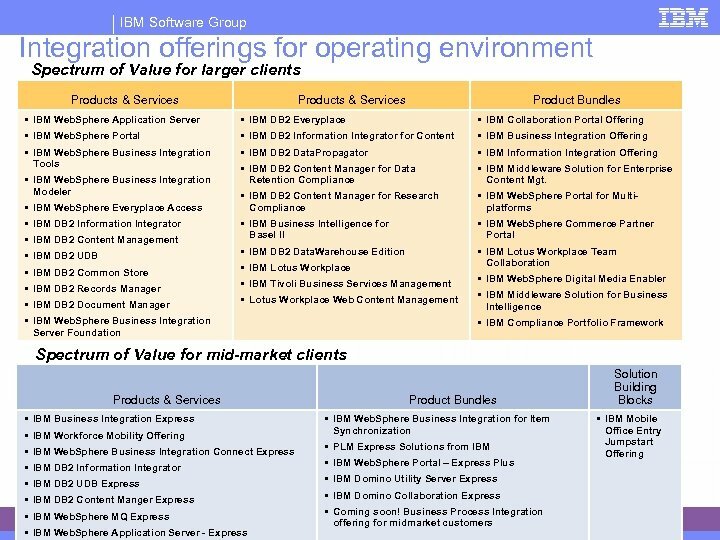 These assets lead with Express products and are developed jointly by IBM and IBM Business Partners around real customer needs and business challenges in the SMB space. 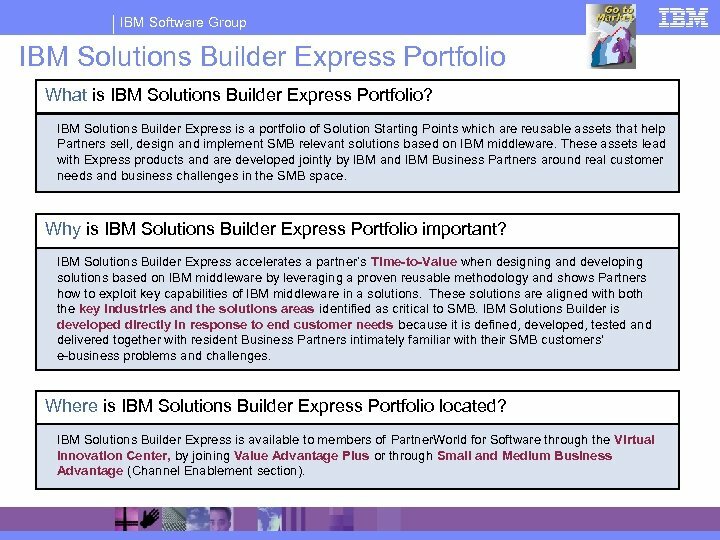 Why is IBM Solutions Builder Express Portfolio important? 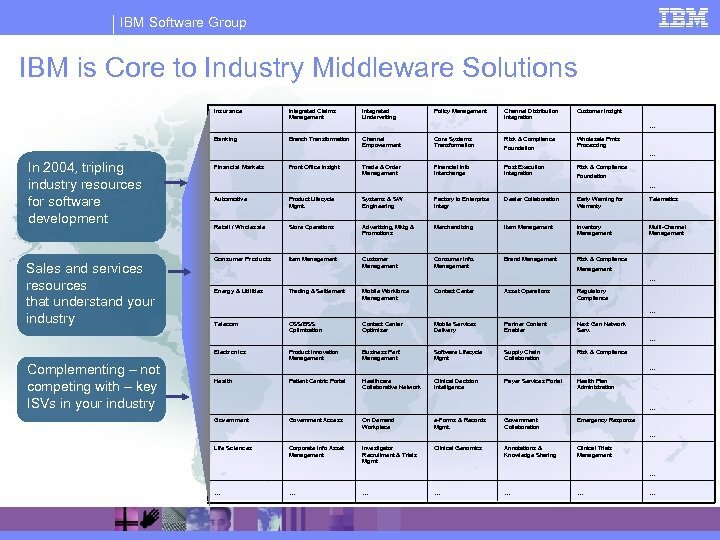 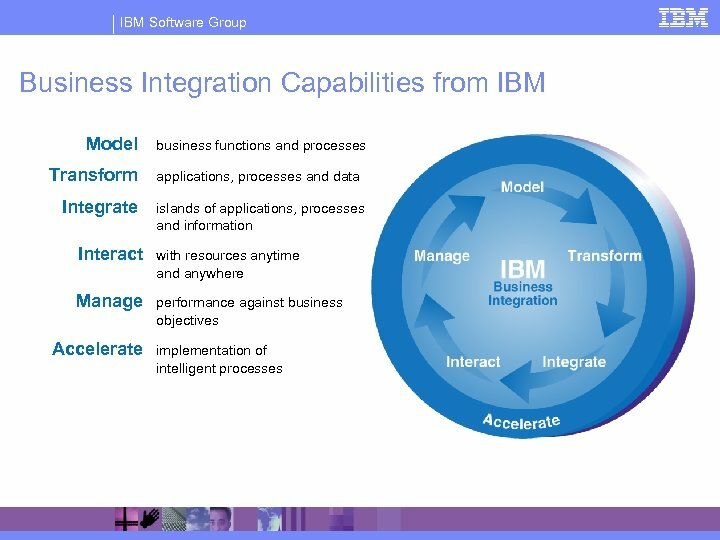 IBM Solutions Builder Express accelerates a partner’s Time-to-Value when designing and developing solutions based on IBM middleware by leveraging a proven reusable methodology and shows Partners how to exploit key capabilities of IBM middleware in a solutions. These solutions are aligned with both the key industries and the solutions areas identified as critical to SMB. 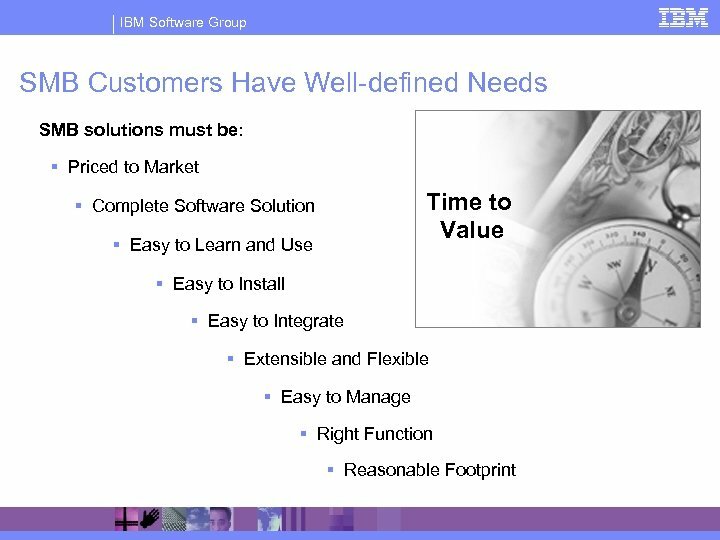 IBM Solutions Builder is developed directly in response to end customer needs because it is defined, developed, tested and delivered together with resident Business Partners intimately familiar with their SMB customers' e-business problems and challenges. 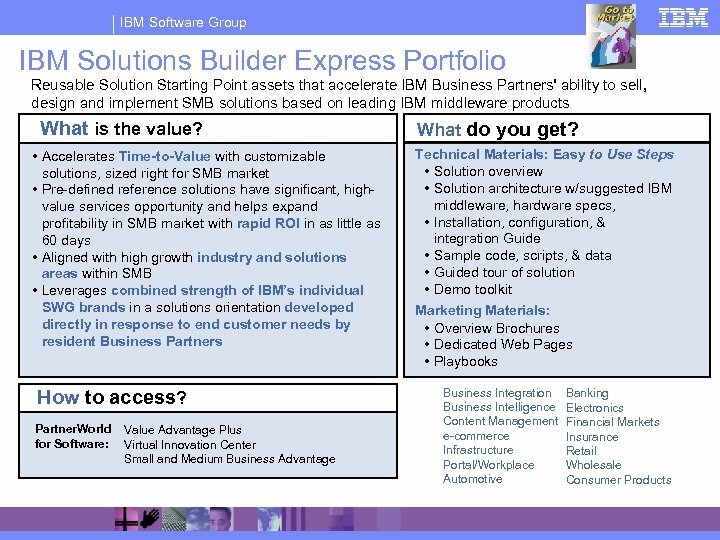 Where is IBM Solutions Builder Express Portfolio located? 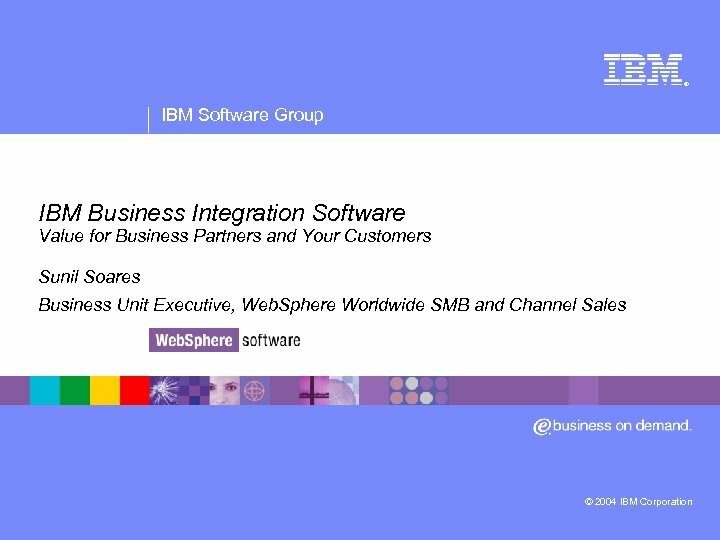 IBM Solutions Builder Express is available to members of Partner. 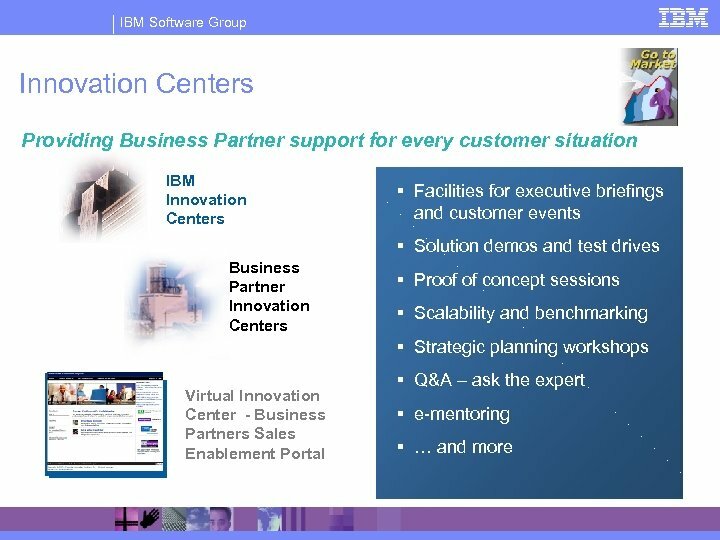 World for Software through the Virtual Innovation Center, by joining Value Advantage Plus or through Small and Medium Business Advantage (Channel Enablement section).